Currently in San Jose and today's weather is slightly gloomy but really not that bad for late May weather. I'm just really glad I wasn't here last weekend when it was an oven. I had initially intended on writing about 2 places to compare their chicken fried steak but it was getting kinda longish so I'll just give both places their respective posts. I've been sitting on this post for a while so here goes the first place. The weather in San Diego has been rather funky... chilly and rainy one minute, warm and sunny the next. A while back ago, I was watching Food Network during my job hunting months. I rarely watch Food Network anymore as it has become filled with with Rachel Ray $40 A Day type shows. I really feel the quality of programs available on that network has gone down hill. I like the original Iron Chef where chefs actually had to use their creativity to make something awesome out of a main ingredient that was totally exotic like fish heads. New Iron Chef... blah! How hard is it to make something when the main ingredient is steak! 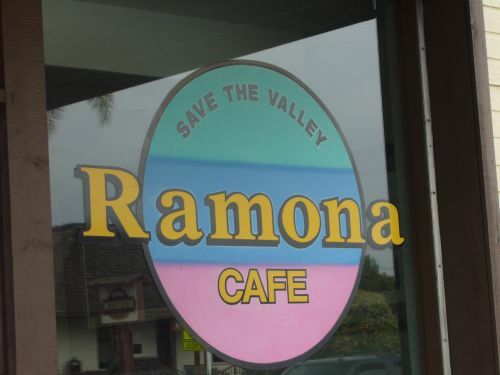 Funny thing is that I was watching Diners, Drive-ins and Dives(one of those $40 A Day type shows) and they were featuring Ramona Cafe in Ramona in the episode I was watching. Turns out one the cafe's specialties is chicken fried steak which piqued my interest in giving the place a run. Who doesn't like chicken fried steak?!? 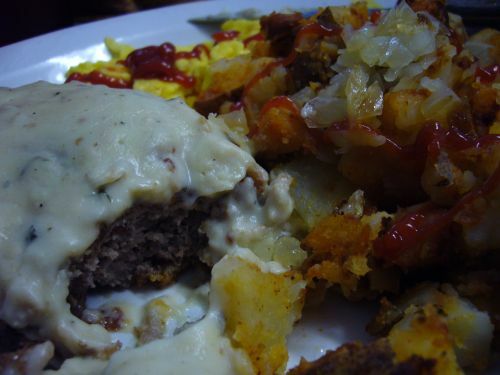 Well seasoned, moist, tenderized cube steak breaded and fried like fried chicken with sausage gravy on the side to maximize the longevity of the crispiness and a side of home fries/ hash browns + biscuits. OMG! I don't eat this all the time or else you'd need to wheel me around in a wheel barrel but I do relish a well made chicken fried steak when I give into cravings. So one weekend, EK, LH, ML and I packed in LH's Fit and we headed on out to the sleepy little town of Ramona. Upon arrival I thought service was a little rude. We weren't even handed menus!!! I saw several other tables receive menus shortly after being seated and eventually got fed up so I asked EK to grab us a few menus only 3 ft away from us. Even then it took some time for the waitress to come take our order. So the orders were taken and the chicken fried steak arrived! I totally forgot to order the gravy on the side and regretted it as the crispiness of the breading soon went away. I found the chicken fried steak to just be ok... definitely not worthy of being mentioned on a nationally televised cable TV show. It was a little on the dry side- tasting like a not so juicy hamburger patty and I think lacking in flavor. Breading wasn't bad but uneventful after the dry meat. Gravy and home style potatoes weren't bad but my eggs weren't at all fluffy. We spotted some cinnamon rolls that looked tasty and were also featured on the show but unfortunately arrived too late to claim them as two ladies at another table just finishing up their meal nabbed the last two. Maybe the cinnamon rolls are the real show stopper of the cafe? Overall I felt kinda... blah about the visit. I definitely wouldn't go out of my way again to visit this place. Maybe if I was in Julian for some apple pie or randomly in the area. I think I felt more bad about dragging the group there. It's one thing to go out of the way and find a gem with other people another to find a dud. mmm, I've never had chicken fried steak, it sounds so interesting! Is cube steak like coarse hamburger? I feel so unschooled! I loooove fried foods, but I still have never had a mind blowing biscuits and gravy experience either. At least it was cheap though eh? Ha! I was just thinking of chicken fried steak today. I looooove chicken fried steak. Even the cheap Banquet version. I'd love to but Wednesdays are tough for me to make from SD. What about a weekend? Of course I'd make a trip out of it. Hit up a bunch of places in LA. You could be my guide ;).